Enter your email address below and once subscribed you’ll get your link to “You’re Late!!!”. short – it cuts to the point, so you can review all of the ideas in just a few minutes. highly practical – each of the seven sections includes actions that you can get your teeth into today. accessible – the file is a PDF, so that you can save it to you computer, phone or tablet. 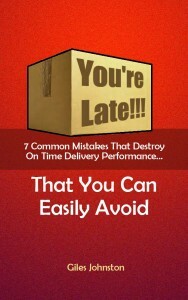 This guide is a good overview of the approaches I use with my clients to help them improve their on time delivery performance, and I hope that you get similar results. To help you get the most from this guide there are a handful of follow up emails scheduled when you sign up for the guide; I want you to get the results you are looking for. As part of the sign up process you will also be added to my email updates, which includes ideas, tips and offers to help you improve your business’ performance. You can unsubscribe from these messages at any time, but hopefully you will find them to be useful. Author of 'Business Process Re-engineering‘ and creator of the online continuous improvement course ‘Making It Happen‘.